I was waiting for close to an hour outside for a red cardinal to come to this bird feeder outside my house. It didn’t pitch but by chance I had taken a couple of shots of this fella. 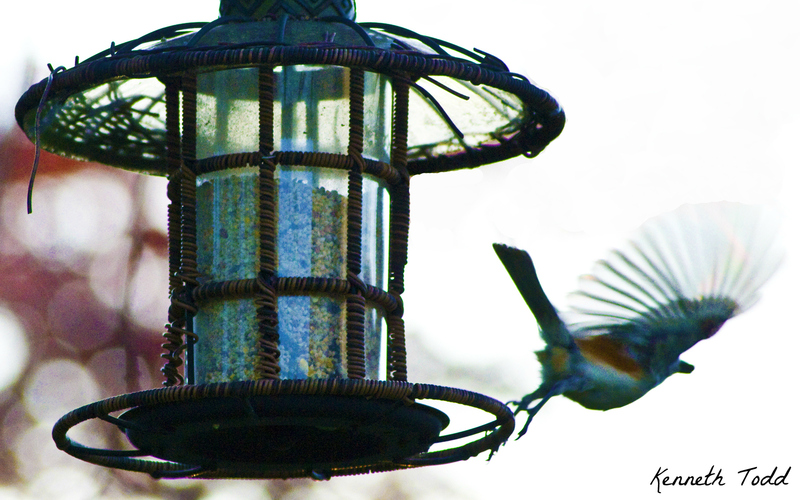 Only when I looked at the LCD a little later did I notice that I caught the bird leaping off the feeder and starting off for flight. I like how you captured the movement of the wing. Creates a realistic effect of the bird’s flight. Wow! What a great shot. Those skittish cardinalsl can be hard to capture. Watching through the window it seems we so much as breathe and they are off. and we only saw him about 2-3 times all winter. He seemed to like to come around mostly just at dusk. Cool shot. I like it. Nice capture. I would be waiting indefinitely if I wanted to get a shot of a cardinal. We don’t have them in our neck of the woods. I need to find out just where and when I could possible see one and tell my husband we will plan our next trip around that. They happen to be my favorite bird. Wow, that’s really amazing shot! Worth of waiting so long 😉 I love this photo! Amazing shot Kenneth… love it! What a great shot!! Patience really pays off, huh? lol.